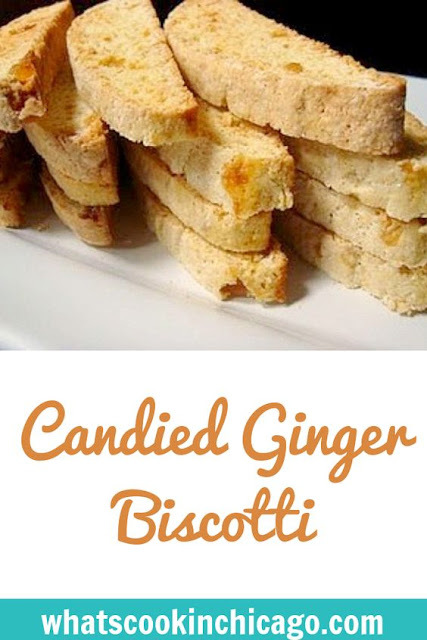 For a holiday party I'm attending this weekend, I made these Candied Ginger Biscotti to share. They were fun to make and I love how easy it is as a base recipe for other biscotti variations. In a bowl of your stand mixer (or with a hand mixer) combine the flour, sugar, baking powder and salt. Beat until blended (about 30 seconds). Gradually add the egg mixture and beat until a dough forms, adding ginger about halfway through. With floured hands divide dough in half. On a lightly floured surface roll dough into a log about 10 inches long and 3 inches wide. 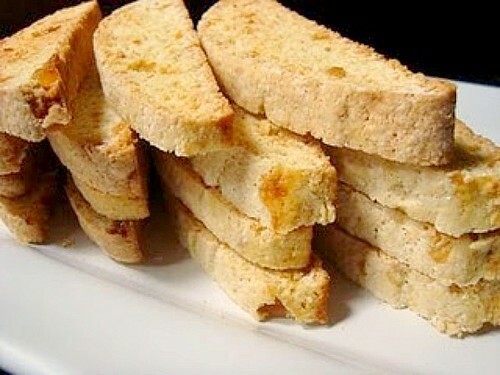 Trander log to the prepared baking sheet and bake for 35-40 minutes, or until firm to the touch. Note - logs will spread during baking. Remove from oven and let cool on a wire rack for about 10 minutes. Transfer log to a cutting board and using a serrated knife, cut log into slices 1/2 inch thick on the diagonal. Arrange evenly on baking sheet. Bake 10 minutes, turn slices over, and bake another 10 minutes or until firm to the touch. Remove from oven and let cool. store in an airtight container. I've never had candied ginger before, can I use fresh ginger instead? Ginger is my new favorite ingredient. I can't wait to try this recipe.